In 2009, the Walt Disney Company acquired Marvel Entertainment, LLC, whose library of characters includes Black Widow, Iron Man, Thor, and almost 5,000 other superheroes. Despite Disney’s access to all of these characters, “Big Hero 6” is its first animated film to be directly inspired by a Marvel comic book superhero team. Those who know Disney only for its fairy tales and princesses and want something different are in for a big treat. Set in the futuristic city of San Fransokyo, a hybrid of Tokyo and San Francisco, “Big Hero 6” tells the story of Hiro Hamada, a young robotics mastermind who participates in illegal robot fighting games. After Hiro’s surprising win in a fight, he gets in trouble and is rescued by his older brother, Tadashi. Tadashi, who is studying robotics, takes Hiro to his lab at the San Fransokyo Institute of Technology to persuade him to use his knowledge for better purposes. In the lab, Hiro is introduced to Tadashi’s friends: Wasabi, an expert in laser-cutting, GoGo Tomago, a specialist in electromagnetic wheel axels, Honey Lemon, a brilliant chemist, and Fred, the school mascot, who is also a huge comic book fan. Hiro also meets Baymax, an inflatable healthcare robot developed by his brother, and Professor Callaghan, the head of the robotics program at the university. Inspired by Tadashi’s friends and their experiments, Hiro decides to get into the robotics program by participating in the annual robotics exhibition. After weeks of hard work, Hiro invents microbots, a new type of nanorobots that can be telepathically controlled and form any shape or structure by joining together. When the day comes, Tadashi and his friends accompany Hiro to the exhibition. However, when a major accident occurs, his microbots seem to be destroyed. After a few weeks, he finds traces of the bots, implying that they may have been stolen. Hiro uses his expertise to upgrade Baymax with fighting abilities and turn Tadashi’s friends into superheroes who use their inventions to find and stop whoever stole the microbots. Unlike many other Disney animated features, “Big Hero 6” is not directly aimed at a younger crowd. There are multiple reasons to like “Big Hero 6” as a teenager or an adult, mainly because Disney has worked hard to make sure that the screenplay and design are as realistic as possible. Although kids may not be particularly interested in the science behind the superpowers of the characters, a more mature and educated audience will enjoy the futuristic technology that is brought to life in this film. Since the decision to adapt “Big Hero 6” was made three years ago, Disney has had enough time to craft a script worthy enough for the title. “Big Hero 6” enjoys the advantage of a script that has the essences of a Marvel film mixed up with the lovely characters of the Disney universe. 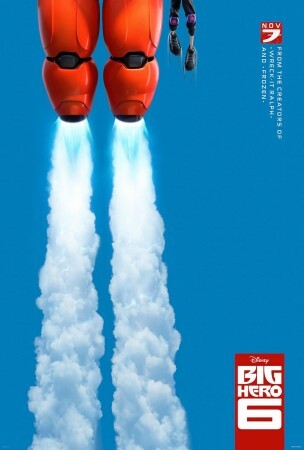 Although follows the formula of many other successful superhero movies and rarely goes off the track, “Big Hero 6” recreates the pattern in a way that is fresh and satisfying. However, “Big Hero 6” has several plot twists and surprises that make it stand out among other familiar stories. Similar to most other Marvel films, it also features a breathtaking post-credits scene that links one of its characters to a Marvel icon. Of the many new characters introduced in the film, Baymax, the inflatable caregiver robot, is by far one of the loveliest characters from Disney, and will surely be on the list of fan favorites, along with Olaf from “Frozen.” Baymax’s character development is reminiscent of Wall-E, the titular character of Pixar’s Oscar-winning futuristic film, who begins as a robot following its orders and evolves into an individual that is able to express emotions far more than it was initially programmed. As far as the graphics and design go, “Big Hero 6” is a masterpiece. Disney has clearly been using powerful workstations with powerful processors in order to create the film’s detailed characters and setting, which contains thousands of highly detailed buildings, vehicles, objects, and people. The city of San Fransokyo is a futuristic simulation of San Francisco with a Tokyo makeover, bringing together a mixture of western and eastern architecture. “Big Hero 6” presents a layered environment such that every scenic view of the city is detailed to the smallest bits, and with the 3D technology stretching the background and giving depth to each object, the audience can expect the visuals to exceed their expectations. Much like Marvel’s “Guardians of Galaxy,” Disney was successful in making a little-known superhero team popular. As much as I would like to see more of these characters, it’s likely that “Big Hero 6” won’t become Disney’s next multi-feature franchise. But Disney has surely found the right way of bringing Marvel characters into its animated features, and I hope that they continue to do so. Until then, I shall re-watch “Big Hero 6” many times, and I strongly suggest you to catch it while you can on the big screen.